A Spoonful of Style: Is It Too Soon For Plaid? Is It Too Soon For Plaid? I just can't help but to start dressing for Fall. I am so over summer clothes and the Summer heat! Plaid is such a staple for the Fall months. So I couldn't resist this shirt from Nordstrom. I love just throwing on cute jeans, boots and a fall shirt and maybe even adding a vest. It is never to early to start shoping your favorite Fall pieces. Oh and don't mind my frizzy hair. It pretty much started raining as soon as we started taking pictures. I am excited about all of the Labor day sales! Tory Burch is having a great Labor day sale. Spend $300 and get 20% off, spend $500 and get 25% off, or spend $750 and get 30% off. We all know it is esy to spend that at Tory Burch. Especially if you are in the market for new boots or a new bag! I linked my favorite pieces below. Enter code LABORDAY14 at checkout. Happy shopping. I hope you guys have a great weekend. I am so excited because my mom is in town! She is pretty much an interior designer so she came down to help me work on the nursery. I can't wait to share it with you guys. Thanks for stopping by. Gorgeous casual look. No it's not to soon for plaid. That shirt rocks! Love this Fall look! I can't wait to break out my plaids and cozy sweaters. You look great! You always amaze me with your style girl!! Perfect bag and shirt! 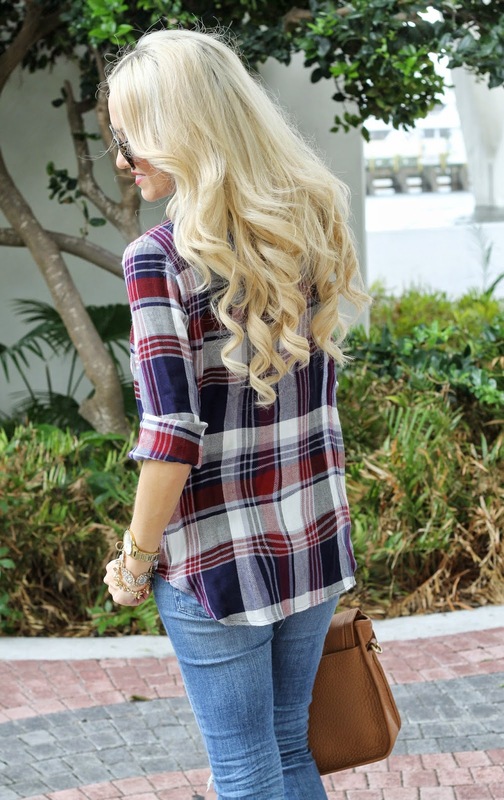 Love that plaid top! I am SO ready for fall! Hope you have a great labor day weekend! I love plaid and flannel and its my favorite thing about fall!! Saw this look on your Instagram the other day - it's so cute! I'm completely over summer clothing too, I can't wait for fall. You look great, Jade! Love the plaid shirt! Great look! It's never too early to start wearing plaid! You look so gorgeous and incredible in that plaid. And oh my, that bag! You styled it to perfection that now it just rocketed up to number one on my fall wishlist. Can't wait to see the nursery, especially with your mom's help, I know it's going to be just as fabulous as you! I don't think it's too early for plaid! And it's definitely a great time to invest in some boots from Tory Burch. I don't think it is too early at all. You look gorgeous and what a great simple but yet so chic look. I don't think it's too early yet, but just still a little too warm for me. Love this outfit! Awesome look! I don't think it's ever too early for plaid, but maybe I'm a little obsessed. I love the way you styled it up with heels while keeping it casual overall. You look gorgeous and I love the plaid! Considering we're only a few days from September I say it's not too early! Your baby bump is absolutely adorable!! When I was pregnant the summer heat was killer, hope you're making it OK! I've been trying to sneak my plaid in with shorts here and there but it's just been too hot =( I'm SO ready for fall too!!! Adorbs! I'm pretty much ready for fall as well! Not so much the cold---but the clothes for sure! It's never to early for anything, especially not if you make it your own look like you have succeeded in doing. I wear plaid right through the year, and you rock this shirt! Great blog!!!! I am sooo in love with your Karen Walkers!!! I followed you on GFC and would sooo love if you would check out my blog and maybe follow back! loving your outfit! loving the plaid! Cute outfit. Love your plaid shirt. plaid is the best for fall! Love this look, Jade! you are glowing!